Bartholdi Park is a wonderful spot for eating lunch, finding a new favorite plant, enjoying a quiet moment and taking a break from a busy day. 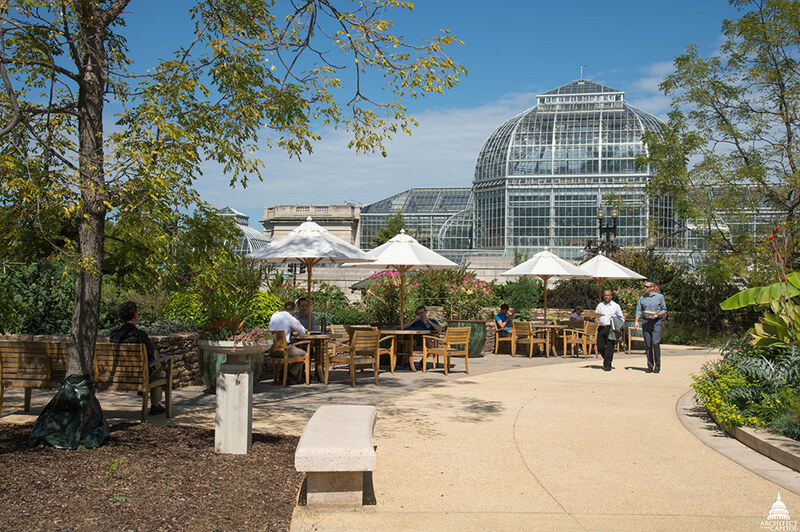 Originally created in 1932, the U.S. Botanic Garden's (USBG) Bartholdi Park had served as a changing home demonstration garden for more than 80 years, and until last year, had not undergone a renovation since its original construction. With the National Park Service's new American Veterans Disabled for Life Memorial next door, the park was designed and renovated to address aging infrastructure and to increase its sustainability and accessibility features. The pathways are now accessible, access to the memorial is improved and new lighting increases safety in the park. 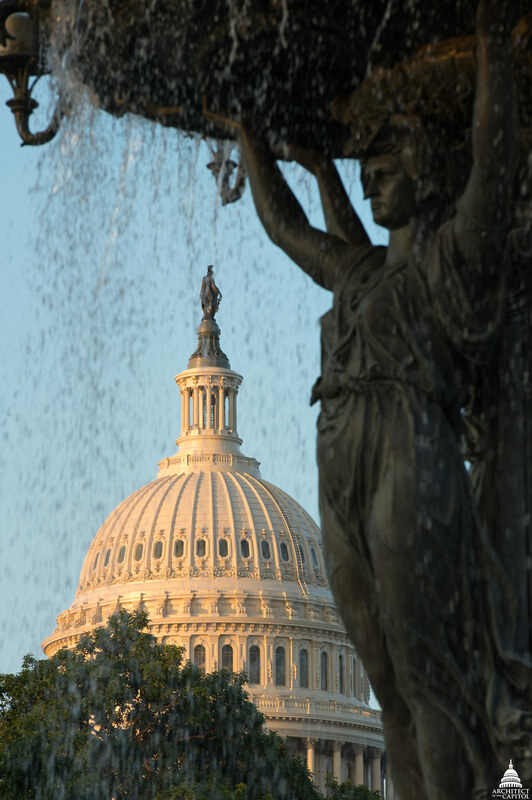 View of the Capitol Dome from the fountain in Bartholdi Park. As planning of the Bartholdi Park renovation was underway, the USBG also worked to develop the Sustainable SITES Initiative® with the Lady Bird Johnson Wildflower Center and the American Society of Landscape Architects. The USBG team is currently submitting Bartholdi Park for certification* through the Sustainable SITES Initiative® (SITES), which is a program for certifying sustainable landscaping projects. 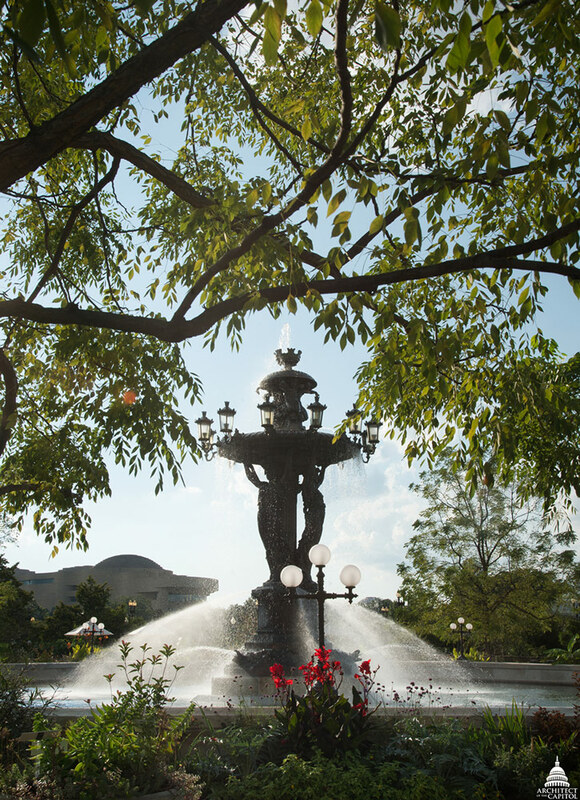 To provide a showcase for SITES principles and the USBG's commitment to sustainability, the Bartholdi Park renovation incorporated the five main focus areas of sustainable landscaping including: hydrology, vegetation, soil, materials and human health. D.C., like many older cities, has a combined sewer system — meaning that rainwater runs into storm drains that connect to the sewer system, and any overflow empties into the river instead of heading to a water treatment plant. SITES aims to reduce runoff into the sewer system, to capture rainwater on-site and, if not storing it for reuse, to get it to percolate into the ground. Plants and soil filter the water and, in combination with the rain gardens, slow it down so that it stays on-site or moves more slowly into the storm sewer. This helps prevent overflows from occurring in the combined sewer system that would then be diverted into nearby rivers. The salvaged flagstone path allows visitors a close view of rain gardens. In the updated Bartholdi Park, 10 newly created rain gardens capture the rain that falls within the park and allow it to soak into the ground. The rain gardens divert water from the combined sewer system and can accept up to 4,000 cu. ft. of water in a 24-hour storm event — that’s equivalent to 256 bathtubs of water. The total amount of impervious concrete surface was reduced to decrease runoff and impervious paths are slightly sloped to direct water into the rain gardens. Being a public garden and an accredited museum with living collections, the USBG has a strong focus on growing and displaying plants and educating visitors about them. 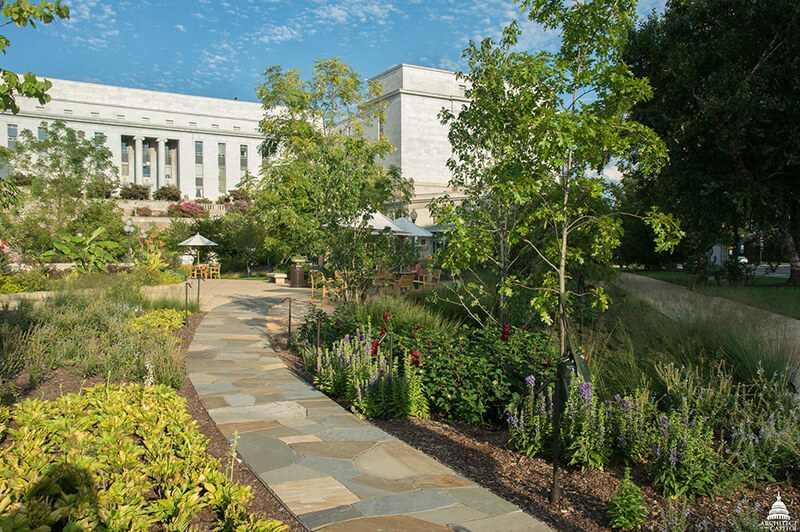 The gardens in Bartholdi Park showcase native plants and a collection of edible plants through both permanent and seasonal plantings in a new kitchen garden. The rain gardens feature plants that can handle periodic water inundation and dry conditions, like the showy hibiscus, swamp rose and numerous native grasses. Most large trees, including the Kentucky coffee trees around the fountain, were saved in place. Throughout the project, the USBG saved multiple large trees and shrubs and other plants were reused in gardens on Capitol Hill and D.C. Public Schools. The majority of the new plantings are plants native to the Mid-Atlantic area, and non-native plants that are regionally appropriate, not recognized as invasive, and are able to handle the area’s heat, humidity, rainfall and damp winters. Soil is a living system. It is important to protect it during construction, and not allow it to become compacted. During the renovation, topsoil was removed and saved off-site, amended with organic compost and returned to the park for the new plantings. In areas where plants were saved, the soil was also protected from compaction. Another component of SITES is reduction of waste both during and after construction, reusing materials, and purchasing locally and sustainably. Existing concrete sidewalks were crushed and brought back and used as the base layer under the new sidewalks. Previous stone walls were disassembled and reused in the new walls for the raised kitchen garden. The park includes permeable pavement (left) and new furniture made from locally salvaged white oak. Flagstone from previous pathways, as well as flagstone, brick and curbstone salvaged from other AOC projects were reused to create new paths, seating areas and the sunken bog. To include furnishings that were locally made and sustainably sourced, a local Virginia company built furniture from a white oak that had fallen naturally during a storm. SITES also focuses on improving human health through the benefits offered by a garden landscape. Studies show that connecting with nature can improve human health and well-being. 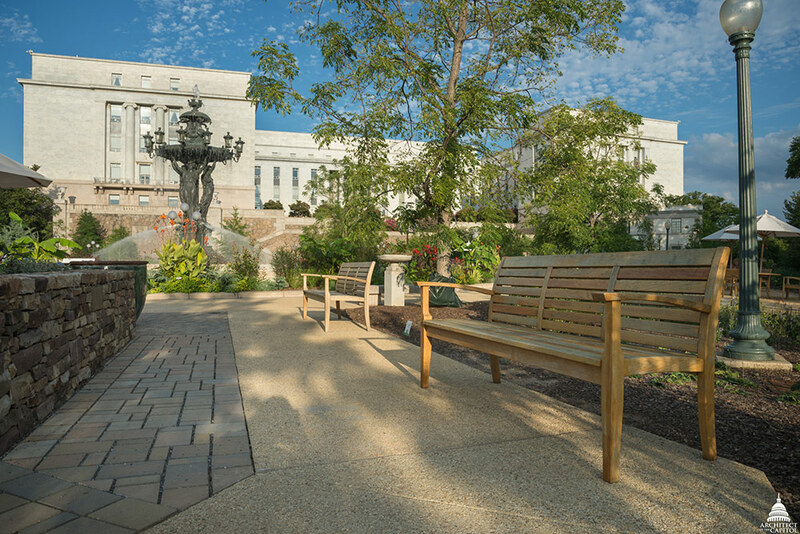 Bartholdi Park continues to provide a place for people to rest and connect with nature. The USBG is offering opportunities to help people connect with nature through programs in Bartholdi Park including yoga and nature-in-motion walks. Other programs for the public include tours explaining the sustainable features throughout the park and how people can incorporate the ideas in their own gardens. Ideas for future programming include cooking demonstrations, classes on urban agriculture, growing edible plants at home and programs specifically for veterans. Visitors enjoying the renovated gardens. The renovated Bartholdi Park continues to have demonstration and educational gardens and now features additional seating, native North American plants, patio gardens, rain gardens, a kitchen garden and accessible gardening areas. Bartholdi Park is poised to welcome visitors from across the United States and around the globe. *Editor's Note: In 2018, Bartholdi Park achieved SITES Gold certification for its sustainability strategies.